The thermosensitive Swamp Collection creates a rich multi-sensory experience out of seating that is inspired by the flora and fauna of the Bald Cypress Swamp. The Swamp Collection consists of five distinctive seats, the Swamp Stool, Swamp Bench, Swamp Lounge, Duckweed Lounge, and Cypress Stool. Each piece is an interactive object that changes color in response to body heat. A simple touch activates the color-changing properties and leaves behind a temporary mark of your body in a rich contrasting color. After several seconds the mark fades away, revealing the piece’s original color. Our interest in creating this collection is to celebrate touch as a fundamental part of the human experience. This project aims to give people a creative, expressive, and often humorous way to connect with each other through the simple act of touch.SWAMP BENCH The Swamp Bench is an interactive piece of furniture that changes color in response to body heat. A simple touch activates the color-changing properties and leaves behind a temporary mark of your body in a rich contrasting color. After several seconds the mark fades away, revealing the piece’s original color. Our thermosensitive upholstery material is a contract grade polyurethane that is UV stable and anti-bacterial. The color changing effect does not wear away with use or degrade with time as the thermosensitive crystals are fully encapsulated into our fabric. The interior of the Swamp Bench is made from cut multidensity foam and wood. This piece is designed for indoor use and is availible in black changing to blue. 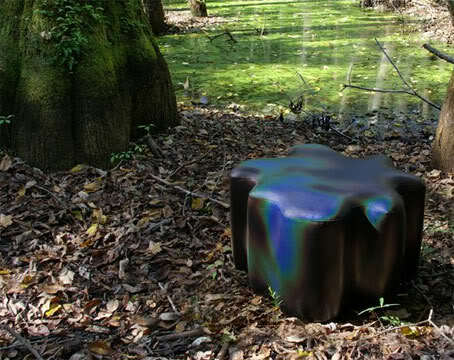 SWAMP STOOL The SWAMP STOOL is an interactive piece of furniture that changes color in response to body heat. A simple touch activates the color-changing properties and leaves behind a temporary mark of your body in a rich contrasting color. After several seconds the mark fades away, revealing the piece’s original color. Our thermosensitive upholstery material is a contract grade polyurethane that is UV stable and anti-bacterial. The color changing effect does not wear away with use or degrade with time as the thermosensitive crystals are fully encapsulated into our fabric. The interior of the SWAMP STOOL is made from cut multidensity foam and wood. This piece is designed for indoor use and is availible in black changing to blue and red changing to violet. 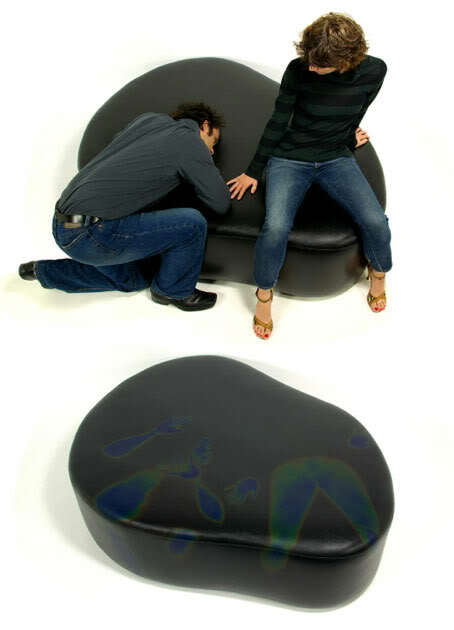 “The idea behind this piece was to turn the rather mundane experience of sitting into something much more expressive. We wanted to give people a creative way to use touch that elicits our imagination and sense humor.